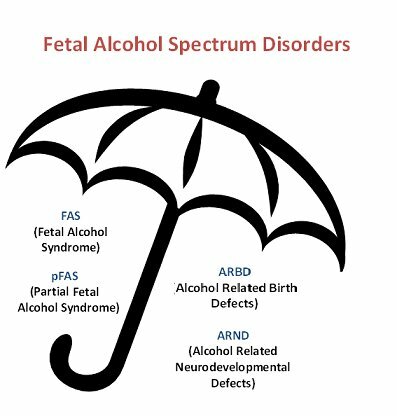 Fetal Alcohol Spectrum Disorder (FASD) is an umbrella term describing the range of effects that can occur in an individual whose mother drank alcohol during pregnancy. These effects may include physical, mental, behavioral, and/or learning disabilities with lifelong implications for the affected individual, as well as the mother, the family, and the community. While FASD is considered preventable, the life circumstances leading to an FASD are challenging, and are often related to social determinants of health , and can be grounded in historical and intergenerational trauma. FASD frequently co-occurs with substance abuse and mental health issues. Treatment modifications for addressing substance abuse and mental health are usually required to support successful outcomes for individuals with FASD. The concept of FASD is relatively young. It wasn’t until 1973 that the link was firmly established between alcohol consumption during pregnancy and disorders in a child, which was called Fetal Alcohol Syndrome. This term was later expanded to Fetal Alcohol Spectrum Disorder, or FASD, to reflect the broad range of life-long, irreversible effects that could arise from the consumption of alcohol during pregnancy. Fetal (is the stage of life) refers to the fetus. Alcohol (is the cause of the disorder) when consumed by the mother, interrupts the normal development of the fetus. There is some research developing that says alcohol may be THE most powerful toxic chemical to an unborn baby or fetus. Alcohol interferes with how cells in the body develop, including cells in the brain. Spectrum (range of disabilities) refers to the range of effects an individual with FASD might have – from mild effects (such as slight difficulties understanding) to severe effects (such as fetal death). Disorder (an abnormal condition) refers to the physical, mental, behavioral, and/or learning challenges of the individual whose mother drank while pregnant. FAS is just the tip of the iceberg, FASD is the whole iceberg. This iceberg represents all people who are exposed to alcohol while in the womb. Some people will develop physical problems, as well as brain damage and are more easily identified – these individuals are just the tip of the iceberg. However, MOST individuals that are affected by alcohol exposure as a fetus cannot be easily identified by sight and yet may have the same serious learning disabilities. 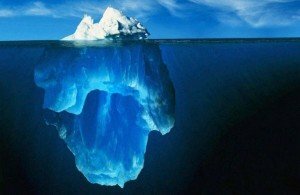 The bottom of the iceberg represents those individuals who have brain damage with no obvious physical signs that identify them as having any problems. This is why FASD is sometimes called the “invisible disability” Many people who have FASD often go undetected and may not receive the kind of support and care that can help to prevent other issues for them later on in life. It is therefore important to get a FASD Assessment and Diagnosis to ensure the necessary supports are put in place. In Alberta it is estimated that 23,000 Albertans are living with FASD. Each year more than 360 Alberta babies are born with FASD. In Canada, prenatal exposure to alcohol is a leading cause of preventable brain damage and birth defects, and one of the top three reasons for developmental delays in children. FASD has no cure; however with effective interventions and supports and understanding, people with FASD can lead meaningful and engaged lives. FASD can affect individuals in many ways. For example, this person, shown in black, is 18 years old and has FASD. He is a great communicator and can talk well, as well as someone two years older than him. However, he doesn’t read as well as others his age, and his ability to take care of himself is like that of 11-year- old. When it comes to life skills like managing his money and remembering his appointments, he is at the level of a child. Socially, he may get along better with young children, which as an adult can be problematic. 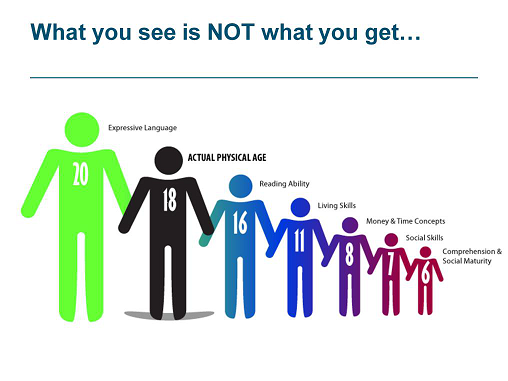 Perhaps this diagrammatical representation above, of how FASD affects individuals begins to put the challenges of individuals affected by FASD into perspective. Attention: This person may be distracted easily, have trouble sitting still, or be unable to focus on one thing. Adaptive Behaviors (Life Skills): This person may have trouble managing their money, getting to an appointment on time, or getting groceries without help. Reasoning: This person may not always make the link between cause and consequence; or understanding how his action leads to a certain outcome. For example, a person with FASD who does something mean to a friend may not understand why that friend is mad at them. Memory: This person may forget things easily, have trouble remembering the right information when they need it, and struggle with following lists of instructions. Executive functioning: This person has difficulty regulating, controlling and managing tasks such as planning, working memory, attention, problem solving, verbal reasoning, inhibition, mental flexibility, task switching, initiation and monitoring of actions. Regulation of body functions: This person has difficulty managing body functions such as: body temperature, sleep, appetite, and bowel movements. This is a summary of some of the brain functions that are typically affected by prenatal exposure to alcohol. There is an also extreme variation between Individuals affected by FASD- some may be affected in certain areas and not others. The effects range from mild to severe, and anywhere in between. With understanding, appropriate expectations and supportive environments, individuals with FASD can perform adequately and live fulfilled lives. However, individuals who grow up without this kind of structured support, may encounter frequent situations in which they are frustrated and punished for their inability to meet the expectations of classrooms, social groups, jobs or communities. Lemoine, Steinhausen and their colleagues have documented the array of difficulties individuals with FASD may experience as adults when there is a discrepancy between expectations and a person’s ability to perform. They identify social isolation, depression, anxiety, suicidal thoughts and attempts, delinquency, unplanned pregnancies, homelessness and victimization as difficulties that can occur when individuals with FASD feel as though they have not succeeded to meet expectations. Determinants of Health: This deceptively simple story speaks to the complex set of factors or conditions that determine the level of health of every Canadian. Robin A. La Due, Ph.D.Robert M. Schacht, Ph.D.Patricia Tanner-Halverson, Ph.D.Mark McGowan, M.A.